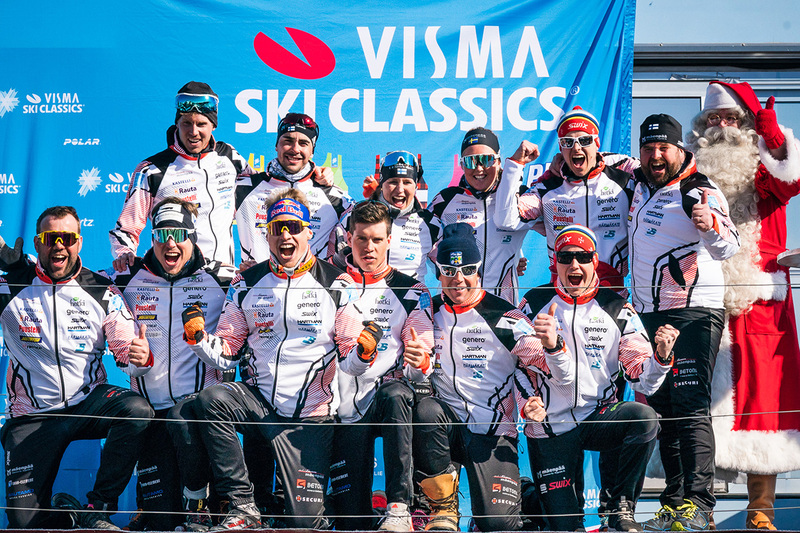 There are only two days before the last event of the Visma Ski Classics Season IX kicks off. Ylläs-Levi is again, for the third consecutive year, the stage for the final race. The preparations are proceeding extremely well, and the weather has been sunny and cold throughout the week. Both the race director Juha Vanhanen and the chief of course Mikko Koutaniemi believe that this year’s race will be the best in the event’s short history. The race is naturally important to all pro teams and there are many exciting battles in sight, but for one team Ylläs-Levi is the most important event of the season. Team Mäenpää, hailing from Finland, sees the race as their main goal, and the whole team is ready to shine under the Lappish sun. The team director Kim Mäenpää has been nominated as a contender for the “Pro Team of the Year” award, and he has indeed shown his passion for long distance skiing and his skills to run the only professional team from Finland. He managed to sign two Finnish superstars Iivo Niskanen, the World Champion and the Olympic gold medal winner, and Anne Kyllönen, a Finnish National Team member, for Ylläs-Levi. Earlier this season in the Czech Republic, the team’s number one skier Ari Luusua became the first Finn to be on the Visma Ski Classics podium making headlines in his home country. Ari is again a strong candidate to join the exclusive club of the Ylläs-Levi podium skiers. Iivo Niskanen will represent the Mäenpää gang in the final race, and he is no stranger to Ylläs-Levi as he was the ambassador of the event last year and finished 5thin the race. Back then he admitted that he wanted to support the event and help it become much like Vasaloppet in Sweden. He also wanted to test his double-poling strength against the best long distance skiers in the world. Kim is happy to have both Iivo and Anne as their latest reinforcements, and he thinks that Ylläs-Levi and his team are going to offer great entertainment and action to all skiers and spectators alike. He also adds that being nominated for the Pro Team Director of the Year award is a great honor, but he is only one person in the team. As the season is almost over, Kim is already looking into the future. He says that they will have a team meeting in May and come up with a new plan for the 10thanniversary season of Visma Ski Classics. But before the much-appreciated break, there is one more race to do, and it would not be a surprise to see a Team Mäenpää skier on the podium. So, let’s get ready for Ylläs-Levi and join the fun!